Each pupil chooses 2 sheets of origami paper. This activity uses the measuring tool and 2 color markers. Folding instructions: Fold 2 opposite straight sides of your sheet and then open your sheet. The pupils should move their finger along the fold in order to strengthen the fold. A discussion question: What has changed on your sheet after the folding? Answer: We now have on the square sheet a line and 2 rectangles. A discussion question: Is the line on your sheet a line of symmetry? Explain. מומלץ להציג את התשובה לשקופית זו רק לאחר שהתקיים דיון. Answer: After the folding, the 2 rectangles exactly cover each other and the line is a line of symmetry. 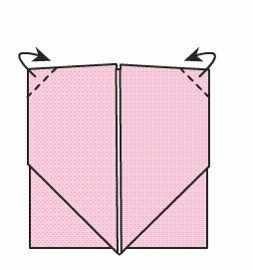 Folding instructions: Fold the sheet on the line of symmetry to form a rectangle. 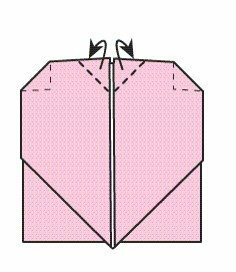 Folding instructions: Fold the shorter sides of the rectangle on to each other. Folding instructions: Open fully the sheet to obtain the large square. Activity: With your two markers color the two lines on your sheet. Are these lines of symmetry? Explain. Use the measurement tool in order to obtain straight lines. This slide should be shown after the discussion. Answer: The two colored lines are lines of symmetry and with each line the sheet is folded into 2 congruent rectangles. Folding instructions: Fold 2 adjacent vertices onto the point of intersection of the two lines of symmetry. A discussion question: Which folded line is the line of symmetry of the pentagon? Esplain. It is suggested to show this slide after the class discussion. Answer: The symmetry line of the pentagon is the fold between the two right angled trapezoids. Folding instructions: Turn over the folded sheet. Fold the vertex of the pentagon onto the opposite straight side as shown in the animation. Folding instructions:Turn over the folded sheet. Fold the shorter side of the rectangle onto the line of symmetry. A discussion question: Is the red marked line as shown, a line of symmetry? Explain. Answer: The red line is not a line of symmetry as it does not form two congruent shapes when folded. A discussion question: If an additional fold is made on the shape will the red line become a line of symmetry? Answer: If a fold is made on the small square then the red line will be a line of symmetry of the folded shape. Folding instructions: Fold backwards two of the vertices as shown. Folding instructions: Fold inwards two vertices as shown. In this slide the 4 folded vertices are shown. Folding instructions: Turn over the folded shape. Folding instructions: Fold a straight side as shown in the animation. Folding instructions:Turn over the folded shape. A heart can be seen! At this stage the pupils should have available a second sheet of origami paper . The final activity: As you wish fold one after each other, 4 folds on your new sheet.Can you find any lines of symmetry on the shapes that can be seen after the folding?